The Intex PureSpa Portable Bubble Spa Set allows you to pamper yourself in relaxing heated water surrounded by soothing bubble jets. The easy-to-use control panel on this garden hot tub activates the 120 high-powered bubble jets surrounding the interior of the spa for a refreshing massage. The built-in hard water treatment system makes water gentler on skin for a soothing experience. The heating system adjusts to fit your personal temperature preference allowing a stress-free spa experience. The Intex PureSpa Bubble Therapy Set provides simple maintenance with two easy-to-replace filter cartridges for lasting enjoyment for up to four people. The Fiber-Tech Construction and the puncture-resistant three-ply laminated material provide the ultimate comfort, support and durability. An insulated cover and lock is included to minimize heat loss and provide an added safety feature. A carry bag is provided for easy storage and transport. 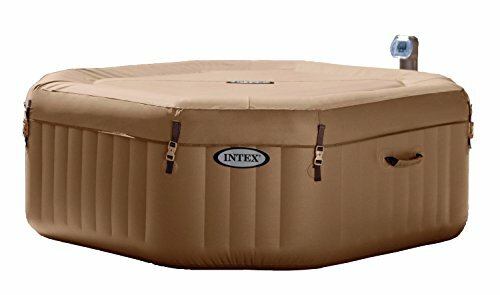 Seating capacity of this portable hot tub: 4 people. Water capacity: 210 gallons. Water temperature range: 68-104 degrees. Includes: inflatable tub, insulated cover, heating system, hard water treatment system, filtration system with 2 filter cartridges, floating pool chlorine dispenser, test strips, thermal ground cloth, inflation hose and carry bag. Approximate inflated inner/outer size: 79 and #34; X 79 and #34;. Height: 28 and #34;. 1-year warranty.